These new members join industry veterans such as Julien Merceron (Square Enix), Mark Cerny (Cerny Games), Rob Pardo (Blizzard Entertainment), Chris Hecker (Spy Party), Chris Butcher (Bungie), Mike Capps (Epic), Laura Fryer (Warner Bros.), Lou Castle (InstantAction), Clint Hocking, and Dave Perry (Gaikai) on the active advisory board. The Board as a whole consists of leading industry notables who rate and discuss every submitted lecture for the show, and participate in multiple in-person meetings regarding the content. "We pride ourselves on providing best practices for game developers of all genres and GDC 2011 will continue this tradition as the gaming space grows and adapts to the evolving market," said Meggan Scavio, director, Game Developers Conference. "We're excited to welcome our newest advisory board members and expect them to bring a healthy balance of their past experiences along with a fresh approach to the conference program. The forward-facing content, inspired sessions, and especially the insightful advisory board are what has kept the event thriving for 25 years, and will sustain it for the next 25." Organized by the UBM TechWeb Game Network, GDC 2011 marks the quarter-century anniversary of the game industry's most comprehensive professionals-only event -- where game developers converge for a week of learning, networking and inspiration. 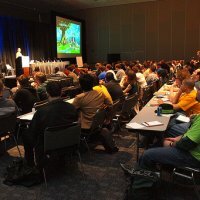 As well as its flagship San Francisco event, the GDC series of conferences also now include GDC Europe (August 16th-18th, Cologne), GDC Online (October 5th-8th, Austin), and GDC China (December 5th-7th, Shanghai) in the remainder of 2010. For more information on the call for papers for GDC 2011 in San Francisco, please visit the official GDC website.